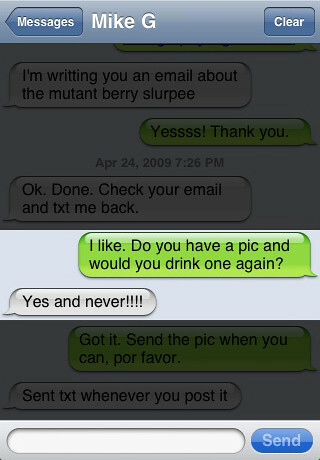 On Thursday, April 9, 2009 at 10:12 p.m., my friend Mike "tweeted" about wanting to know why 7-11 would create a Slurpee flavor called "Mutant Berry." I suggested that he review it for Nate's Plate and he agreed. I quickly forgot about this until last Friday when he asked for my email address so he could send me his review. I assume he got to sample the frozen treat at work since he photographed it next to a fax machine and he doesn't seem to be the kind of guy who owns a fax machine. 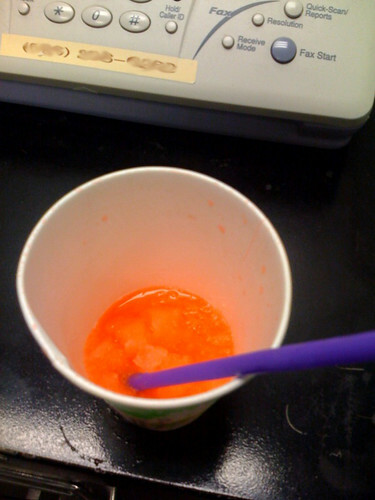 What we have here is more of a sneak preview about the consequences of this concoction, which happens to be neon orange -- a color unaffiliated with any berry having regular genetics. Also noteworthy is the fact that he would "never!!!!" drink it again. I had a taste of this too! I noticed that all of the Slurpee options were caffeine free EXCEPT for the coke, and Mutant Berry. It struck me as odd, and when I tasted a sample, I realized that the crazy metal + cherry + gasoline flavor truly was a mutant of unnatural things. Go for Piña Colada if given the choice! !